Having some readily available grocery store brands in your condiment ledger is important; walking down the "ketchup aisle" and being able to pick out the keepers from the crap is a true life skill. 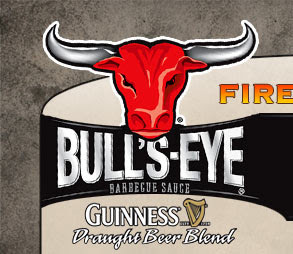 While I remain salty with Bull's-Eye for discontinuing one of the most unique BBQ sauces on the grocery store circuit (Raging Buffalo*), I respect the brand as one of the better retail sauces available. The Guinness Draught Beer Blend is handy. It's a great stand-alone sauce (perfect on burgers, dogs, even ribs or chicken) or it can be used as a unique base for homemade sauces. You don't really taste the Guinness per se, but there is a noticeable, unprecedented hickory/malty/chocolate-y flavor that is yummy-yummy.